Located near Caorle in Italy, the luxury camping site of Laguna Village will offer a tranquil and serene camping holiday that is just as ideal for a couple as it is for the entire family. If you desire to learn more or should you wish to book an excursion to this luxury camping destination, please contact Lux-Camp for more details. As is already hinted by the name, the holiday camping site of Laguna Village is located quite close to the popular Caorle Lagoon. This ideal for those who enjoy aquatic activities, such as swimming, fishing and diving. Boat hire services are also possibilities which are offered. 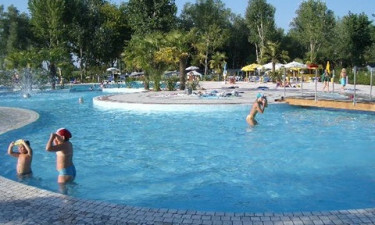 Why should I consider choosing a camping holiday at Laguna Village near the town of Caorle? Another benefit that needs to be mentioned is that all on-site luxury tents and mobile homes are located within only a short distance away from the historic village itself. While we cannot overstate the natural attraction of this region, anyone who appreciates a bit of history will find this town very appealing. From quaint cobblestone streets to the nearby church of Madonnina dell'Angelo, countless hours can be spent immersed within this rich culture while returning to one's luxury tent will take only a matter of minutes. There are a number of local bars which will offer only the freshest of regional foods. Families can expect to enjoy sumptuous dishes of fresh fish, meats and other healthy Mediterranean cuisine. Other locales will offer handmade ice cream; a delicacy particularly known in this region of Italy. 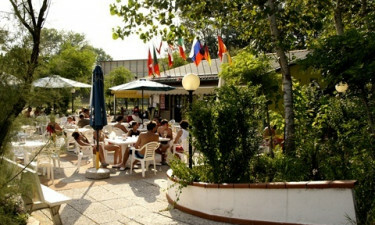 While there are bars located in the village itself, there are also pubs to be found along the picturesque beaches here as well as upon the shores of the nearby Caorle Lagoon. So, camping in luxury has been taken to a whole new level. Feel free to enquire at Lux-Camp and learn what other benefits await. Both a supermarket and a bazaar are easily accessible from all mobile home and bungalow tent sites. This large outlet will offer such items as fresh bread alongside fruits and vegetables that are delivered daily. The bazaar sells tobacco, camping equipment and even international newspapers. These are only a handful of the reasons why a camping holiday at Laguna Village is indeed one of the most popular choices for travellers from around the world.